Definition: The 1801 Judiciary Act (Midnight Judges Act) was "An Act to provide for the more convenient organization of the Courts of the United States". John Adams, leader of the Federalists, signed the act into law on February 13, 1801, less than 3 weeks before the end of his presidency and the start of the Jefferson presidency. President Thomas Jefferson, leader of the Republicans (Anti-Federalists), later repealed the act on March 8, 1802 by the 1802 Judiciary Act. 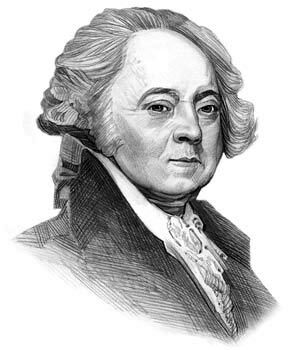 John Adams was the 2nd American President who served in office from March 4, 1797 to March 4, 1801. One of the important events during his presidency was the 1801 Judiciary Act which is also referred to as the Midnight Judges Act. Thomas Jefferson was voted as the next President in November 1800, but would not assume office until March in the following year. This enabled President Adams to get things done before the new president and his political party took over. The two men were from opposing political parties. Adams was a Federalist and Jefferson a Democrat-Republican. During the time between the end of the old presidency and the start of the new, the 'Lame Duck' Congress took the opportunity to pass the Judiciary Act of 1801 to give Adams the power to appoint new judges. This ensured additional Federalists would be in powerful positions in the new government. The act significantly enlarged the national judiciary, and Adams seized the opportunity to appoint his Federalist friends and supporters to the new offices. These men could be depended upon to protect Federalist legislation from the rising Democratic-Republicans. The judges who were appointed to these new courts were called "Midnight Judges" by the Republicans because they were last minute appointments. President John Adams was alleged to have stayed up until midnight on March 3, 1801 completing the paperwork before his term in office ended the following day on March 4, 1801. President John Adams appointed 16 Federalist circuit judges and 42 Federalist justices. One of the "Midnight Judges" was William Marbury, who was named as Justice of the Peace for the District of Columbia. Thomas Jefferson and the Republicans were furious about the passing of the 1801 Judiciary Act. President Jefferson refused to allow the 'Midnight Judges' to take office (including William Marbury). Jefferson instructed his Secretary of State, James Madison, not to deliver the "commission," or notices, of appointment. William Marbury sues the government (on the behalf of several other judges) and demanded that the Court issue a 'Writ of Mandamus'. This writ is "writ of mandate" which orders a public agency or governmental body to perform an act required by law when it has refused to do so. This was a power given by the Judiciary Act of 1789. William Marbury believed that this action would force President Jefferson to accept these appointments. The matter was referred to Chief Justice John Marshall of the Supreme Court in Marbury v. Madison. Chief Justice Marshall ruled that the 1789 Judiciary Act was unconstitutional because it gave the Judicial Branch of government powers not granted to it by the Constitution. The Supreme Court could therefore not compel President Jefferson to accept the appointment of William Marbury. The Federalist William Marbury never became Justice of the Peace in the District of Columbia. President Jefferson repealed the 1801 Judiciary Act on March 8, 1802 by passing the 1802 Judiciary Act. The 1802 Judiciary Act effectively reversed the Federalist law of 1801 and turned the clock back to the law according to the Judiciary Act of 1789. The Jefferson administration also got rid of many other Federalist officials by repealing the Internal Revenue Act. "Jefferson got repealed all the direct federal taxes passed by the Federalists and boasted that ordinary Americans would never see a federal tax collector in their whole lives." The case of Marbury v. Madison set the precedent that the federal judiciary could review the acts of the other two branches of government. This principle became known as judicial review meaning that the Supreme Court can overrule both state and federal laws if they conflict with the Constitution. This meant that the Supreme Court always had the ultimate check on legislative and executive power - effectively putting the brake on the power of the government when enacting future laws. The info about the 1801 Judiciary Act: Midnight Judges provides interesting facts and important information about this important event that occured during the presidency of the 2nd President of the United States of America. The article on the 1801 Judiciary Act: Midnight Judges provides an overview of one of the Important issues of his presidential term in office. The following video will give you additional important facts, history and dates about the political events experienced by the 2nd American President whose presidency spanned from March 4, 1797 to March 4, 1801.